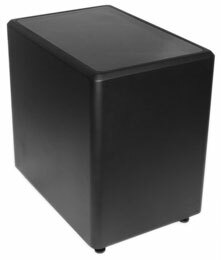 The LFM-1 Plus takes our highly acclaimed LFM-1 Subwoofer to the next level. A new more powerful amp, special EQ, and custom port plug combine to deliver an amazing 18Hz while maintaining a linear response right across it's audible bandwidth. Now, you no longer need to sacrifice low frequency extension to maintain that smooth "true to the original" sound of your favorite recordings. Dimensions: (HxWxD) 21.50" x 15.0" x 22.0"